Saint Nicholas has been for hundreds of years a popular saint in the East and in the West, greatly famed as a worker of miracles. There are many charming legends concerning him. One tells of an occasion in heaven when all the saints came together to talk and to drink a little wine. Saint Basil filled the golden cups from the golden jug, and everyone was deep in conversation when it was noticed. That Saint Nicholas was nodding. One of the blessed nudged him until he awoke, and asked why he was slumbering in such good company. In Holland Saint Nicholas puts in an appearance on the eve of his feast. As the children sing, the door flies open and on the floor drop candies and nuts — right on a white sheet that has been spread out just in case. And after he has gone, there is hot punch and chocolate and boiled chestnuts served with butter and sugar. And in the morning, children find in the shoes they have set before the fire toys and many other good things — candy hearts and spice cakes, letterbankets, which were candies or cakes in the form of the child's initials, ginger cakes or taai-taai in patterns of birds and fish and the form of the saint himself. He also brings a hard cooky, called Speculaus. 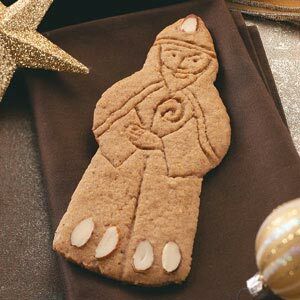 This hard spice cookie is made for the feast of St. Nicholas in Holland. Traditionally, the dough was rolled into carved wooden speculaas molds. Cream the butter and sugar, add the egg, and continue beating. Add the grated lemon rind and the flour sifted with the baking powder, cinnamon, and salt. Let the dough rest overnight in a cool place. Roll out as thinly as possible — about the thickness of the back of a knife blade. Cut into desired shape and bake at 350° F. for fifteen to twenty minutes.